The Nashville City Paper reviewed Einstein Is a Dummy, a children's play written by Mexican-American Karen Zacarias. The last show was February 18 at the Nashville Children's Theater. "Karen Zacarias was just 10 years old when she and her family first came to this country from Mexico. But she remembers it like it was yesterday." "'It was tough. I found myself in a lot of remedial classes, not because I wasn’t smart but because I couldn’t find the right words,' she said. 'It felt like no one understood.'" "Years later, as a public school teacher and founder/artistic director of The Young Playwrights’ Theater in Washington, D.C., Zacarias encountered kids facing the same feelings of inadequacy." "'So many kids struggle with school, but they’re very talented and creative in other areas. They may not fit the mold of the perfect student, but there’s a lot going on in those brains.'" 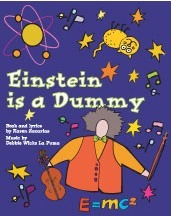 "Zacarias’ experiences inspired her to team up with composer Debbie Wicks La Puma to create Einstein is a Dummy..."
"The result is an engaging musical that follows a fictional day in the life of a 12-year-old Einstein. Distracted by his own curiosity, poor Albert doesn’t fit in. He’s always late or getting lost, and nothing comes out right when he tries to talk to Elsa – the prettiest girl in music class..."